You would think with a four-day weekend (I have no classes on Friday), I would have had time to complete my first project without losing sleep. Wrong. 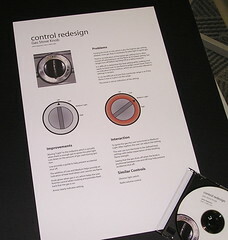 The project was to redesign a singular control for John Zimmeran’s Introduction to Interaction and Visual Interface Design. We had to produce a 11×17 color poster mounted on a 23×17 black board. In addition, we had to provide a CD with the PDF of the poster, and we had to design the CD. With the best intentions, I set out to complete the project by Sunday, which would leave me all of Monday to do other assignments and perhaps even relax a bit. While I completed 90 percent of the project Sunday, what having another day available to me meant was that I had a whole other day to rethink everything! I also underestimated the number of hours I would spend trying to get the CD label to print correctly. Hours. Dumb. But hell, despite my Labor Day being full of labor, my project is complete. And though I’m not completely happy with the result, it’s complete. I’m sure the project would have went more smoothly had a done a few of those things before. But like I said, doing new stuff is fun, which is why I don’t mind that I won’t get much sleep tonight.